Regarded as one of the classic New Zealand walkways, the Queen Charlotte Track is a long track, not a steep one. This means that the distances walked each day (particularly on days 3 and 4), are challenging. The terrain is regarded as undulating, with hills ranging from sea level to a maximum of 400m. This spectacular track, stretching from historic Ship Cove to Anakiwa, passes through lush coastal forest, into coves and inlets, and along skyline ridges offering breathtaking views of the Queen Charlotte and Kenepuru Sounds. The decision really is whether to walk the entire 71km track over four days, or enjoy a short section to suit your timetable. For all walkers, a moderate level of fitness and experience is required, especially if contemplating a 3-5 day hike.? ?The Queen Charlotte Track, located at the top of the South Island in the Marlborough Sounds, is unique for its stunning coastal views, historical landmarks and wonderful variety of native bush and wildlife. The Sounds’ temperate climate enables the track to be walked all year round, with the most popular season being from November to May. The track is wide in most places and all major streams have fixed bridge crossings.? ?You can start or finish the walk at any of the points along the way. There are guided or self-walking options available and, better still, both self and guided walkers can have their packs carried for them from any of the access points along the track by arrangement with different operators. For those with a little more time, or seeking something a little different, there are many other activities that can be enjoyed en-route. These include swimming, fishing, sailing, sea kayaking, mountain biking, bird watching, diving and historic side trips. Glow worm grottos add to the walkway’s nightlife. The romance of arriving or departing the track by sea or air adds to the experience. With its historic interest and many comfortable accommodation options along the way serving good food and wine, one of nature’s wonderlands is a paradise unto itself. You can walk the track in either direction, but many prefer to set out from Ship Cove. The walking times mentioned below are only a guide and lean more towards a person with a slow walking speed. A day walker with a light day pack will take less time than a tramper with an overnight pack. The track itself is well signposted, but some overnight accommodation may not have signs. There is no road to Ship Cove so you’ll need to arrange boat transport to begin your walk there. Camping is not permitted at Ship Cove but there are toilet facilities. Most visitors to Ship Cove take time to explore the historic site and enjoy reading the interpretation panels around the site. The track climbs away from the beach, passing through a largely first growth forest, where the high canopy is complemented by a diverse range of low-lying shrubs and small trees. On the ridges higher up, beech trees dominate. After 50 minutes walking, you will reach a lookout point at a saddle, where you can enjoy good views of both the inner and outer Queen Charlotte Sound. Beyond the saddle, the track drops into Resolution Bay, where there is a DOC campsite and, further along, private cabin accommodation. From Resolution Bay the track follows a well-graded old bridle path over a ridge and into Endeavour Inlet. It winds downward and follows the shoreline to the head of the inlet. Cabin and motel accommodation are available on the way. From Endeavour Inlet, the track stays near the shoreline and wanders through regenerating forest rich in small birds. It rounds Big Bay to Camp Bay where there is a DOC campsite and, a little further on, cabin accommodation. 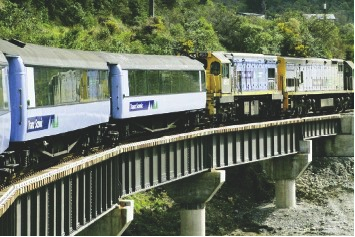 It is possible to bypass Camp Bay by using a direct track to Kenepuru Saddle. This is the longest and most arduous section of the journey. However, from the top of the ridge you will be well rewarded with magnificent panoramas of the Sounds. 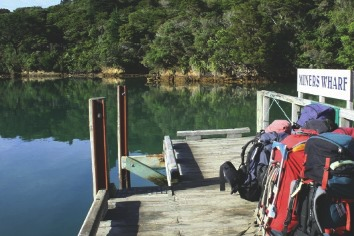 Climb out of Camp Bay to Kenepuru Saddle and follow the ridge separating Queen Charlotte Sound from Kenepuru Sound. Above Bay of Many Coves and Kumutoto Bay are two DOC campsites, Bay of Many Coves and Black Rock campsites, each with water, toilets and a cooking shelter. Eventually the track descends to Torea Saddle between Portage and Torea Bay. There is a DOC campsite at Cowshed Bay and private accommodation in Portage. This part of the journey also follows the ridge line. Here gorse and manuka are prolific. Off to one side, a track leads to a lookout just before the descent to Mistletoe Saddle begins. At Mistletoe Bay there are cabins and campsites. These need to be booked in advance. Camp fees can be paid to the camp caretaker. There is also accommodation at Te Mahia Bay. Beginning on the road above Mistletoe Bay, this section follows old bridle paths high above the water. The track descends to the DOC campsite at Umungata (Davies Bay). The final hour’s walking is on an easy path through mature beech forest. At Anakiwa you’ll find a shelter, toilet and phone and a public jetty 800m along the road. Here you can catch a bus or a boat to Picton or to nearby accommodation. With such good access by road and/or sea, most sections of the track can be used for day walks. There are also several short side-trips along the way. At Ship Cove, take the Waterfall Track to a small waterfall in the forest (30 min return). Behind Furneaux Lodge is a short walk to another waterfall. It passes through a forest of giant trees entangled in the thick cables of climbing plants and vines (30 min return). At the head of Endeavour Inlet, a track leads you to the antimony mines worked last century. Keep to the marked track around the shafts (2 hours return). In Mistletoe Bay, the James Vogel Nature Track allows you to explore the forest behind the picnic and camping area (45 minutes return). The Peninsula Walk explores the peninsula between Mistletoe and Waterfall bays (30 minutes return). While Queen Charlotte sound is generally warm and dry in summer, remember it is a coastal environment, which can change quickly, so be prepared for rain, cold and windy conditions, and possibly a muddy track. Food (should be lightweight, fast to cook and high in energy value, e.g. Breakfast: cereal, firm bread, spreads. lunch: cracker biscuits, cheese, salami. Dinner: instant soup, pasta/rice, dried vegetables/fruit, cheese or dehydrated meals). Winter campers should also take: additional warm, quick-drying clothing. synthetic thermal wear is better than cotton as they dry quickly and give more warmth. – torch and spare batteries. Before your trip, confirm with each accommodation house what will be provided, including meals, packed lunches, bedding and towels.? ?Fires: No fires are permitted in the open. The Marlborough Sounds is a restricted fire area. No fires are allowed unless a permit has been previously obtained from DOC or a sounds Fire warden. During periods of extreme drought and high fire risk, the track may be closed and open fires are prohibited.? ?Water: all water should be treated, filtered or boiled for 3 minutes to make it safe to drink. Don’t use soap in streams. Always carry drinking water, particularly between Kenepuru and Te mahia saddles. Water taps are provided at the DOC campsites and washing sinks are provided in the cooking shelters. Water supplies are limited, so use sparingly. During dry seasons a water supply may be empty. Private land: sections of the track cross private land near to private houses and baches. Please respect the owners’ property and do not take vehicles, firearms or dogs on the track. The sections of track on these properties only exist through the good will and cooperation of the land owners. Rubbish: There are no rubbish facilities along the track: please take your rubbish away with you. walkers leaving the track at Punga Cove are required to take their rubbish back with them to Picton. Disclaimer: The distances and times between locations are suggested from government website statistics. We take no responsibility if walking any or all of the Queen Charlotte Track take longer to travel than what has been estimated above.